I have a prize on offer today,courtesy of Chambers. They provide some of the best dictionaries,crossword solvers and reference books around,so feel free to click on the link to see what they have to offer. 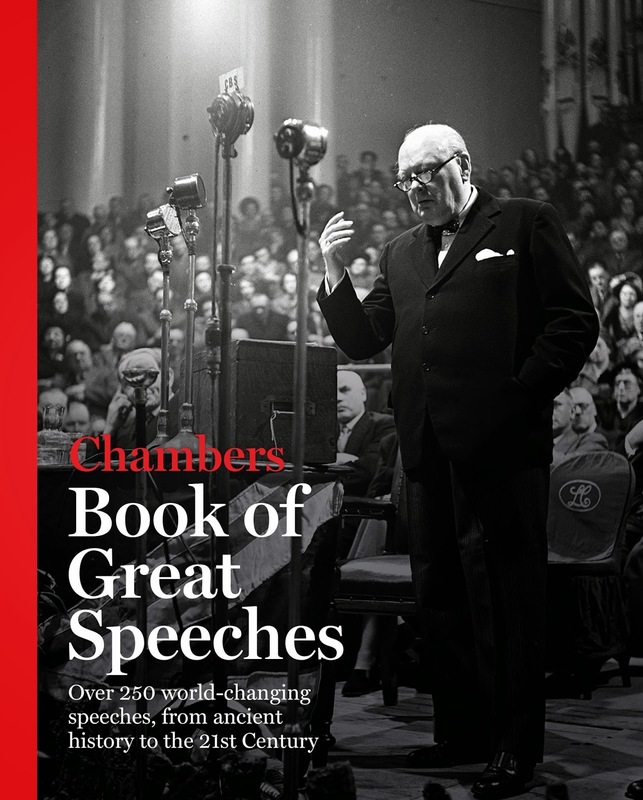 I have a brand new copy of the Chamber 'Book of Great Speeches' on offer. I'm sure many of you will be interested in this. To win you need to answer the 10 Questions below and e-mail them to justquiz@hotmail.co.uk before midnight UK time 24th November. Entry open to everyone (except my family),as Chambers will post globally. You just need to provide your name and country you live in, for now, but I will need to get the winner's full address,in order to send the prize. The winner will be decided randomly and the decision will be final. 1. 'Votes for Women', a popular slogan in the campaign for women's suffrage in the United States, was a 1901 speech by American author and humorist? 2.Which four-word phrase,was famously used by Soviet premier Nikita Khrushchev,while addressing Western ambassadors at a reception at the Polish embassy in Moscow in November 1956? 3.Although it ultimately proved fruitless,it is considered,by some,as one of the most effective speeches ever made on behalf of a candidate.Which politician,and later US President,made the speech known as 'A Time For Choosing', during the 1964 US Presidential election,in a bid to boost the prospects of the Republican candidate, Barry Goldwater? 4.Primarily concerning the Memphis Sanitation Strike,the 1968 speech known as, 'I've Been To The Mountaintop',was the last public speech delivered by Martin Luther King Jr. In which Memphis building, also known as the central headquarters of the Church of God in Christ, did this speech take place? 5.In winning the 2002 Best Actress Academy Award,(for films made in 2001),which actress gave a memorable speech,which included the passage,'This moment is so much bigger than me. This is for every nameless, faceless woman of colour,who now has a chance tonight, because this door has been opened'? 6.After 2130 consecutive games,which baseball legend started his farewell address by saying, 'Fans, for the past two weeks you have been reading about a bad break I got. Yet today I consider myself the luckiest man on the face of the earth'. He also closed the address by saying 'So I close in saying that I might have had a tough break – but I have an awful lot to live for!'? 7.Sometimes regarded as 'the greatest speech of the greatest orator in the world',which Athenian statesman and orator delivered his famous 'On The Crown' speech in 330BC when he defeated Aeschines whilst defending his fellow Athenian,Ctesiphon? 8.In 1940, Charles De Gaulle obtained permission from Winston Churchill,to make a speech on BBC radio.This famous speech was a passionate appeal to the French people,to not give up hope and to continue the fight against the German occupation and the Vichy Regime. The speech was in response to which French leader' 'plot' to form an alliance with Germany during World War II,where he was later convicted for treason? 9.Which US President gave an address known as the Four Freedoms speech. (technically the State of the Union address),where he proposed four fundamental freedoms that people 'everywhere in the world' should enjoy? 10.What is the name of the city hall in Berlin,where in 1963,John F Kennedy made is very famous 'Ich Bin Ein Berliner' speech,which he gave to to show US support for West Germany in the wake of the construction of the Berlin Wall?